Happily sipping away on a treat-laden milkshake, dripping in excess chocolate and sweets evokes asense of delicious indulgence to which nothing elsewill ever come close. Let your imagination run as you create the shakesof your wildest dreams and enjoy the mouthwateringdecadence that results. From the Infamous Nutella Milkshake, to the aweinspiringDouble Decker, the delectable Vivo laVogue to the brain-bending Billy Bonka, there issomething for everyone to enjoy and indulge. 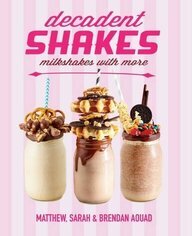 Whatever your taste, spoil yourself and yourfamily and friends with deliciously decadentshakes you ve only ever dreamed of."